Brit Awards winners now and then: Do you recognise these stars? Out of the eight British winners from last night's Brit awards, more than half first uploaded their tracks to BBC Music Introducing - a platform for unknown artists to get their music heard. Each winners' musical style has developed a lot since then, as has their image. Radio 1 Newsbeat has dug out photos from the archives to show what the Brits winners looked like before their careers took off. Winner of the Brits global success award, Ed Sheeran first uploaded one of his tracks to BBC Music Introducing in Suffolk in March 2009. He was just 18 years old at the time, and would return to BBC Music Introducing two years later, on stage at Glastonbury where he performed his first big single, The A Team. 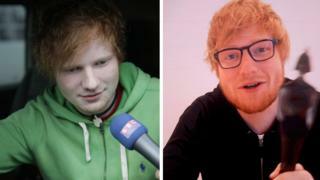 Known for his bright ginger hair and love of hoodies, Ed looks much the same in 2019 as he did at the beginning of his career - barring the growth of an impressive beard. 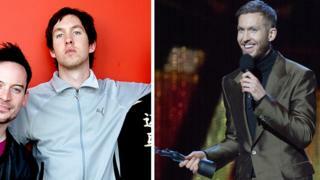 You might have a hard time recognising Adam Wiles, better known by his stage name Calvin Harris. His look is vastly different from when his music was first broadcast on BBC Radio Scotland in 2009. 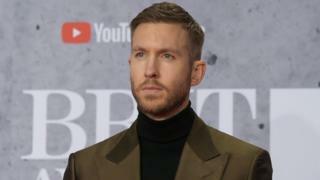 Calvin won two awards at the Brits last night for British producer of the year and British single - the latter was shared with Dua Lipa for their song One Kiss. Originally from Dumfries in Scotland, Calvin made his debut in 2007 with Acceptable in the 80s and The Girls. In February 2012, BBC Music Introducing in the West played a song called Angry Hills by an unknown artist named George Ezra. The then 18-year-old singer would return the following year with the release of his debut EP Did You Hear The Rain? It included the hit song Budapest, played live for the first time for BBC Music Introducing in the West at Glastonbury Festival in 2013. 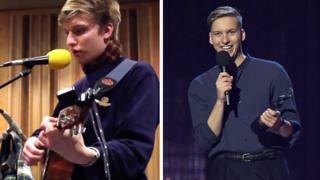 Fast-forward six years and Hertfordshire-born George Ezra won British male solo artist, going up against Sam Smith and Craig David, among others. BBC Music Introducing was launched in 2007 for emerging artists to share their music - there are now over 198,000 acts registered and over 500,000 tracks uploaded. In 2018 alone, 79,168 tracks were added and just under 14,000 of these were broadcast on BBC radio shows. It would take 248 days to listen to all of the tracks - enough time to travel to the moon and back 41 times or watch every episode of EastEnders twice. Between them, BBC Music Introducing artists have released 15 UK No.1 singles, 66 UK Top-10 singles, 29 UK No. 1 albums and 75 UK Top-10 albums. Other famous artists who have uploaded their tracks include Jack Garratt, Izzy Bizu and James Bay. 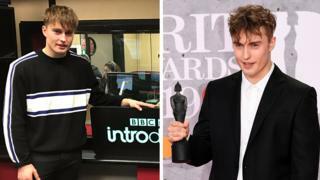 Critics' choice winner Sam Fender is only a few years into his fame - he first uploaded Play God to BBC Music Introducing in the North East in 2017. The 22-year-old started writing songs when he was 14, and regularly performed in pubs around his hometown of Tyneside. He was discovered in a bar by his now-manager Owain Davies, who also looks after Brits winner Ben Howard. 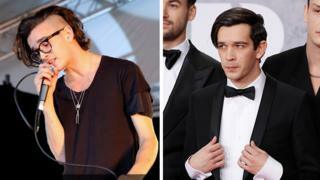 The 1975 won two categories last night, including British album of the year and British group. Lead vocalist Matty Healy made headlines with his acceptance speech which referenced misogyny in the music industry. Originally from Manchester, the band was formed in 2002 and have changed names five times. They first uploaded tracks to BBC Music Introducing in 2009 under the name Drive Like I Do. 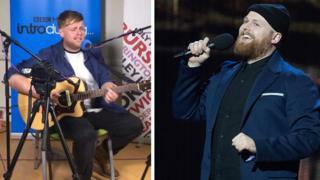 Winner of British breakthrough act, Tom Walker, first uploaded his track Sun Goes Down in November 2015. The artist is seen here during a performance for BBC Music Introducing from Stoke without his trademark beard. His hit song Leave A Light On has been streamed more than 500 million times and is the sixth most searched-for song on Shazam in the UK. Originally from Glasgow, the singer will release his debut album What A Time To Be Alive next month on 1 March.